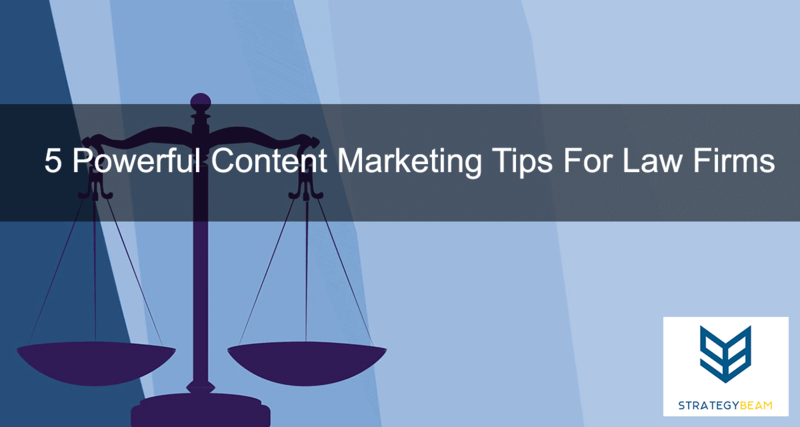 Content marketing is an original strategy for many law firms. I am amazed by how few law firms take advantage of their knowledge and leverage that knowledge to grow their audience and establish their brand. Even the most technical law firm can create compelling, entertaining, and informative content that will generate leads and increase their exposure. Let’s take a look at why a law firm would want to look into content marketing to expand their clientele, plus some real-life ideas your law firm could use! One of the easiest ways to build a content marketing strategy is to start with your clients. Think about what their needs are at each step of the process that you work with them on. What are their fears? What are their most frequent questions? You can take these “pain points” and create content that educates and informs your clients (and potential clients) so they can come to trust your law firm. One of the best examples of this can be seen at the American Bar website, where they created a diagram that shows the potential outcomes of each stage of the court process. Not only does this type of content help make the abstract and confusing topic more approachable, but it can also provide you with a valuable tool to show your clients where they are and what to expect. Help A Reporter Out (HARO) is an online service that connects reporters with experts on a particular topic. HARO is one of the fastest growing publicity services that attorneys can use to promote their firm on the local and national stage. Free PR from leading news sources. High-quality inbound links that build your online ranking. Provide opportunities for additional news sources. Use your media spots as part of your testimonials/about pages. HARO is a great way for you and your firm to gain free publicity and build your digital marketing strategy. Be sure always to provide relevant, timely, and professional insight to grow your online presence. Is there a controversial scene where a protagonist makes a questionable choice, or does a situation in the plotline need a further examination? You can talk about that from a legal perspective and discuss what could happen or what the character should prepare for. You can also talk about similar situations in history, and how the scene is akin to that real life case. This format could be like “The Talking Dead” after a T.V. show where you tie in an area of your expertise into a review of the show plotline, event, etc. You can use this opportunity to interject legal analysis of a specific scene or situation from the show and give your technical insight. You can amplify the impact of this entertaining content marketing idea by spreading the word with PR (point #1). Either you or your digital marketing strategist should reach out to blogs and other news sources connected to the T.V. show you are talking about. Once you connect, you can get your insight featured on their site for great exposure. Let’s face it, the law is a confusing beast for much of your audience. Since laws and regulations impact nearly every aspect of society, this gives your law firm a fantastic opportunity to provide clarity and insight on complicated matters. Using current events as a basis for content creation offers creative direction, relevant content, and an intersection between what your audience is looking for and your expertise. Popularity: People are likely searching for it. Relevant: The issue is on the minds of your audience. Expertise: Since your audience is looking for the information, you can show your expertise in a meaningful manner. One excellent example of one law firm doing this right was seen on Eric Goldman’s blog. On his blog post on February 19, 2016, Eric broke down the highly publicized case of Uber International and Uber Entertainment. Eric did an excellent job breaking down the case into terms that are easy to understand. He did a great job making the jargon accessible and found a balance to make law, tech, and marketing entertaining and informative. There is no better way to grow the standing of your website or your exposure than with a scholarship. Establish a scholarship and reach out to local school and colleges to promote it. Have them link to your site from their “Scholarship” page. This will boost your search rankings. For example, let’s say that your firm practices internet privacy and you wanted to start a scholarship about the issue of internet privacy. You could ask participants to write about the recent Google Europe ruling and its impact on how people communicate. Members would submit their answers to you, and you would post first, second, and third winners on your blog. In this case your firm gets great SEO backlinks from universities and colleges, you get free content by people writing about your case, and the winner receives financial backing. This is a win all around, and you can use it as a great local PR campaign to show your involvement in the community. As a result, your community will know your authority in the subject manner and will likely come to you with their legal needs in that area. This may seem like an easy answer to growing your firm, but the truth is that many attorneys don’t use social media correctly. It’s not about how many “Likes” you have, but how much engaging content you produce to establish your brand. An example of a law firm who knows what to do on social media is Trust Tree on Twitter. This law firm specializes in trademark law, and they keep their Twitter account fresh by featuring trademark law updates from history. Each day I look at their feed to see the history of trademark law for that day. Granted I don’t need a law firm for trademark issues, I know that if I ever do I will turn to them. This is because I know they are a great law firm based on their content, and their Twitter account keeps them at the top of my mind. Keep your clients (and potential clients) thinking about you by using social media to the full potential! As your law firm grows you will need to find more profitable clients. The best way to grow your law firm is to follow the basic steps from content marketing like focusing on PR, engaging your audience and producing great content that is being searched. Take these tips and launch your law firm to new levels in your community and beyond. What questions do you have about content marketing for your law firm? Let us know in the comments below and let’s get your law firm content marketing strategy going!